In the name of progress, Malacca City too has not escaped the wave of urbanisation, with planned skyscraper and other modern edifices promising to reinvent its landscape. However, in its enthusiasm to be counted among other major hubs that drive the economy of this country, Malacca should remember that its uniqueness lies in its rich historical heritage, which have drawn visitors both near and far throughout countless decades. While some of its timeless legacies are now protected and preserved by law, this alone should not be enough. Progress, though necessary, must also be mindful of the sanctity of some of the structures listed here, complementing rather than contrasting against the city’s alluring ancient landscape. A Famosa, meaning “The Famous”, has lived up to its name until today. 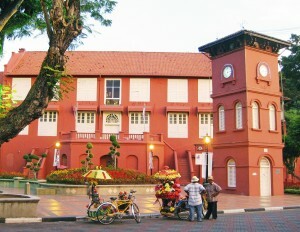 Being the hallmark of Malacca, it is among the oldest surviving European structures in Asia. What’s left today is the tiny gate – called the Porta de Santiago – of a once mighty fortress. 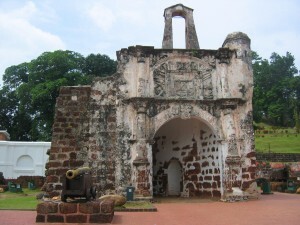 The Portuguese constructed the its fort after capturing Malacca from its Sultan in 1511 to secure their position. This mighty sprawling fortification was built under Alfonso d’Albuquerque’s command. Laterite stones, mortar and stones from royal mausoleum and mosque were used as building materials. Thereafter, more was added to the fort by the Portuguese to thwart attacks by the armies of the Sultan of Malacca and the Achenese. 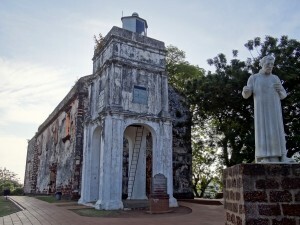 Located on top of St Paul’s Hill, this church was built by a Portuguese Captain, Duarte Coelho in 1521. Initially, it was known as “Our Lady of the Hill” by the Portuguese. It was renamed St Paul’s Church by the Dutch who later turned it into a burial ground for their noblemen. In this church, there is a preserved burial spot which once contained the body of St Francis Xavier before he was shipped to Goa, India, in 1553. His body was buried temporarily in 1552 waiting for the monsoon seas to subside prior to being exhumed and reburied in Goa. Before burial, his right arm was removed and sent to the Pope in Rome. Coincidentally, the St. Francis Xavier statue’s right hand was broken off by a falling tree in 1954. 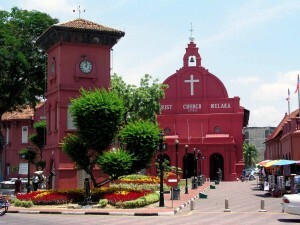 The building you can never miss when visiting Malacca city is Christ Church, one of the famous maroon-painted landmarks here. Completed in 1753 by the Dutch, it is one of the oldest Protestant churches outside of Europe. It became an Anglican Church when the British took over. No nails were used in its construction and like most of the Dutch colonial style buildings, this church was laid out in a simple rectangular shape of 82ft by 42ft. The beams of the church were constructed from cuttings and carvings from a single tree. Its roof is covered with Dutch tiles. As for the walls, they used Dutch bricks built on local laterite blocks derived from nearby island, Pulau Upeh. Later the blocks were coated with Chinese plaster. Unusually for a church, it is topped with a weathercock which was considered inauspicious by some and is blamed for the decline of the nearby Baba community. The building is situated next to Christ Church. Stadthuys was built in the 1650’s by the Dutch as a municipal town hall and the governor’s residence on the site of an earlier Portuguese building. It has had various makeovers and alterations during its lifetime and now serves as the Ethnography Museum. The Stadthuys is said to be a fine example of Dutch masonry and woodwork skills. It currently features various aspects of Malacca’s diverse society in the 20th century. 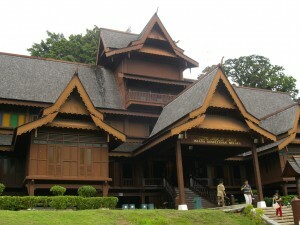 This beautiful wooden building is a replica of the 15th century palace of the Sultan of Malacca. It was built based on the description and reference of the palace of Sultan Mansur Shah (1456-1477) in the Malay Annals (Sejarah Melayu). Serving as a cultural museum today, it is the one and only Malay Sultanate palace from the state’s glory days with a high quality of delicate workmanship. It is worth a visit to see its beautiful interior and the garden in front of the palace. Built in 1728, Tranquerah Mosque, or Masjid Tengkera, is one of the oldest mosques in the country. 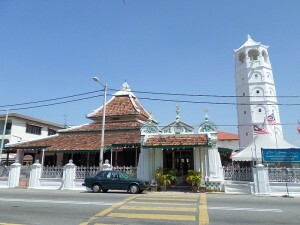 Located in Melaka Tengah, the mosque was the State Mosque before Masjid Al-Azim was built. The original mosque structure was made entirely of timber brought in from Kalimantan, Indonesia. It has since undergone several renovations and restorations. Alongside this mosque is the tomb of Sultan Hussain Shah, the ruler of the territories of Johore and Singapore in the early 19th century who was famous (perhaps infamous) for agreeing to sell Singapore to Sir Stamford Raffles in 1819. 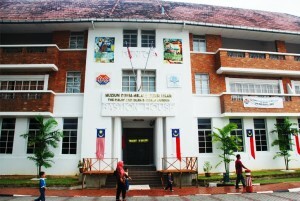 Built in 1912, the former site for Malacca Club now houses invaluable exhibits of Malaysia’s struggle leading to its independence. You can learn about how the history of Malacca and the history of Malaysia are strongly knitted with one another. At the Proclamation of Independence Memorial compound, you will find the car that Malaysia’s first Prime Minister, Tunku Abdul Rahman Putra, used to announce the country’s independence at Padang Pahlawan, Malacca. Exhibits are in the form of relics, manuscripts, video tapes, films and slides. This temple was built in the year 1822 and locals nicknamed it “Datuk Chachar”. It is believed that Goddess Amma has the healing power for this illness called “chachar”, now commonly known as chicken pox. 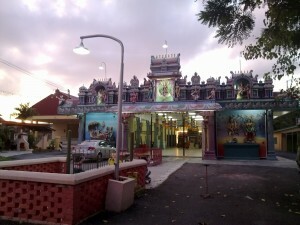 The Muthu Mariamman Festival held at this temple is a major annual attraction. Bastion House building, which houses the Malay and Islamic World Museum, was built in 1910 by the British rubber company Dunlop. The company used the building until 1986. Exhibitions in the museum feature information about the spread of Islam in this region of the world, important and historical Muslim figures, displays of important Islamic buildings, artifacts, traditional dress and other interesting things to see relating to the Islamic world.